You know there's something wrong with the movie business these days when a stylish but fairly straight-forward thriller with top notch production values and a recognizable cast like GRAND PIANO finds itself relegated to a 2 night only engagement at the Cleveland Cinematheque. That's not a dig at the Cinematheque by any means. It's just absurd that such a mainstream film can only find a theatrical home at a venue with a reputation as the place where movies too uncommercial even for Cleveland's other arthouse, the Cedar Lee, get played. That's without getting in to whether the movie is good or not, since that's hardly a criteria Hollywood takes into account when deciding what films they'll be opening on 2000 screens on any given weekend. But enough of my editorializing. If you're reading this, you probably do care whether or not GRAND PIANO is any good. And I suppose it is, at least up to a point. 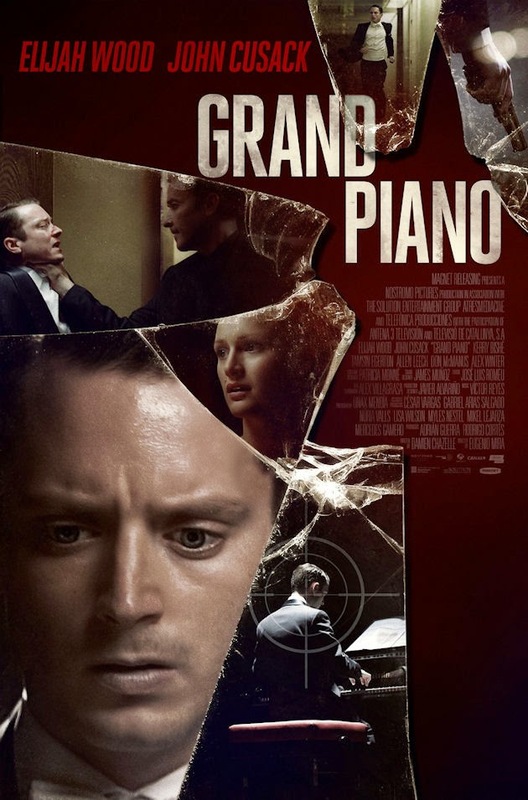 The plot concerns virtuoso pianist Tom Selznick (Elijah Wood) playing his first concert in five years. During that last performance, a moment of stage fright caused him to botch a complicated piece, and it's still uncertain if Tom has regained the confidence that mistake cost him. When Tom takes the stage, he notices a message written on his sheet music threatening his life. Further messages follow on each page, eventually leading Tom back to his dressing room mid-performance (during a rest) where he finds a cell phone. On the other end of the phone, a voice (John Cusack) warns him that if he plays one wrong note, he gets a bullet in the head. Any attempts to flee or alert someone to his predicament, and Tom's movie star wife Emma (Kerry Bishé) will be killed as well. I'm going to give a SPOILER ALERT here, although if you can't figure out within 5 seconds that the only other name actor in the film who has a seemingly insignificant part is involved in the plot, you clearly don't watch very many movies. With that out of the way, then, it soon becomes apparent that the unseen mastermind has an assistant (Alex Winter – yes, of BILL AND TED fame), and that these guys aren't messing around. When a couple of audience members stick their noses where they don't belong, the assistant takes them out with extreme prejudice. It looks like Tom has no choice but to play the concert of his life. At least he doesn't have to play the piece that tripped him up before, right? Yeah, right. The plot is pretty ridiculous, but between Eugenio Mira's stylish direction and the intense performances by Wood, Winter, and Cusack, the film manages to make the convoluted motivations and leaps of logic go down a bit easier. Mira's camera swoops and swings one minute, then finds just the right way to frame a static shot the next. Hitchcock and DePalma are the two most obvious visual influences, but there's also a touch of Argento, and the overall feel of the film, not to mention Damien Chazelle's implausible script, are highly reminiscent of 1970s/80s giallo films. Unfortunately, Mira doesn't have the stomach for the kind of inventive murder set pieces that were always a trademark of the giallo genre. Some critics like Variety's Guy Lodge have praised this bloodlessness, but to my mind it undermines the film. Everything about the film sets up certain audience expectations, as when Winter picks up a shard of broken mirror to do in one of the minor characters in a carefully set designed room that's just begging to be painted red. It's hard not to be disappointed when the scene cuts away early, though less bloodthirsty viewers may feel differently. Mira clearly has the talent to be a first rate genre director; he just needs better scripts to work from to reach his full potential, or barring that, a little more willingness to shock and horrify. The fact that even with a script as shaky as GRAND PIANO he still manages to deliver a reasonably engaging thriller proves that. 2 ½ out of 4 stars.